A conveyance of land or of any interest in land in Indiana should be made by a deed in writing that has been subscribed, sealed, and acknowledged by the grantor or by the grantor's attorney (32-21-1-13). A conveyance is defined in the Indiana Statutes as an instrument of writing concerning land or interest in land, except a last will and testament, a lease not exceeding three years, or an executory contract for the sale and purchase of land (32-21-3-1). The Indiana Statutes, section 32-17-1-2, provide the wording for a conveyance in fee simple with a covenant from the grantor. The statutes also provide a form for a quitclaim deed (32-21-1-15). Both of these are common forms of conveyance in this state. The forms can be tailored to suit the specifics of a transaction. Except for the limitations listed in this paragraph, the power to convey property in Indiana is extended to individuals, aliens, corporations, and those claiming jointly. The limitations on conveyances of real property in this state apply to mentally incompetent persons and those under 18 years of age. However, any person under 18 years of age may, with the consent of the circuit, superior, or probate court in the county where the person resides, convey, mortgage, or agree to convey or mortgage real estate or interest therein if married to someone who is at least 18 years old (32-22-1-3). Natural persons who are aliens, whether they reside in the United States or another country, may acquire real estate by purchase, devise, or descent; may hold and enjoy real estate; and convey, devise, transmit, mortgage, or otherwise encumber real estate in the same manner and with the same effect as a citizen of the United States (32-22-2-5). When a husband and wife purchase real estate or lease real estate with an option to purchase, it will create an estate by the entirety, unless the intent to create a tenancy in common appears in the instrument (32-17-3-1). A joint deed of conveyance by a husband and wife is sufficient to convey and pass any interest described in the deed of either or both of them in land held by them as tenants in common, joint tenants, or as tenants by the entireties (IC 32-17-3-4). The method of conveyance and type of deed used are determined by the way title is held and the intentions of the parties involved. 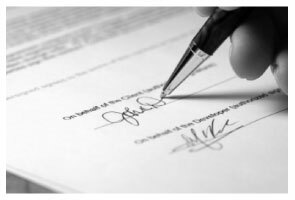 In order for a conveyance, mortgage, or other instrument of writing to be recorded in Indiana it must be signed and acknowledged by the grantor or proved by an officer approved by Indiana law. If the instrument is acknowledged in another county in Indiana other than the county in which it is to be recorded, the acknowledgment must be certified by the clerk of the circuit court of the county where the officer resides and attested by the seal of that court. However, according to statute, an acknowledgment before an officer having an official seal, if the acknowledgment is attested by that official seal, is sufficient without a certificate (32-21-2-4). If acknowledged out of state, the conveyance must be certified by the clerk of any court of record in the county in which the officer receiving the acknowledgments resides, and attested by the seal of that court (32-21-2-5). A certificate of acknowledgment, when required, should be written on or attached to the instrument. In conjunction with the appropriate acknowledgements, an instrument must also meet local and state guidelines in order to be recorded. A conveyance must be recorded in the county recorder's office in the county where the property is located. A conveyance of any real estate in Indiana in fee simple or for life, a conveyance of any future estate, or a lease for more than three years after the making of the lease is not valid and effectual against any person other than the grantor, the grantor's heirs and devisees, and persons having notice of the conveyance or lease, unless the conveyance or lease is made by a deed recorded within the time and manner prescribed by Indiana Statutes (32-21-3-3). Priority of recorded documents is determined by the time of filing. A conveyance is fraudulent and void as against a subsequent purchaser, lessee, or mortgagee in good faith and for a valuable consideration if the purchaser's lessee's, or mortgagee's deed, mortgage, or lease is recorded first.